This union drive is especially significant due to Target’s notorious union-busting scare tactics, including anti-union propaganda videos that all new employees are forced to watch. 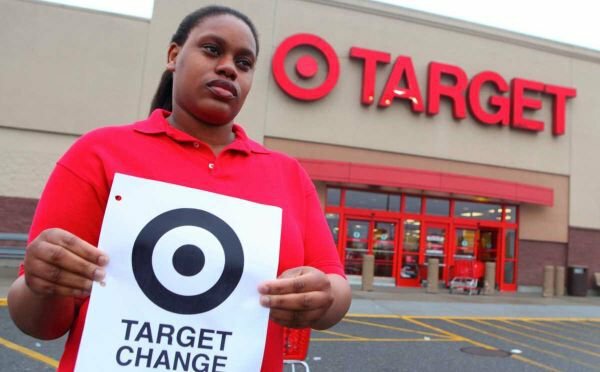 (Gawker.com, March 19, 2014) By proving that it’s possible to organize in even the most anti-union workplaces, these workers have set the stage for more Target and other low-wage workers to win union representation. On Sept. 28, United Farm Workers celebrated the 50th anniversary of its founding in the fields of California with an announcement of long-fought-for rules protecting farmworkers nationwide from pesticide poisoning. In Washington, D.C., UFW President Arturo Rodriguez applauded the new U.S. Environmental Protection Agency rules that end decades of exclusion of farmworkers from when labor laws were first enacted in the 1930s. In those days, most farmworkers were African Americans in the South or Mexican and Filipino immigrants or Mexican Americans in California and Washington state. The EPA estimates that 10,000 to 20,000 physician-diagnosed pesticide poisonings occur each year among about 2 million farmworkers. Over the years, farmworkers have fought for and won regulations in individual contracts against pesticides in Washington state, Texas and California. The first was with a California grape grower in 1967. The new EPA rule requires all pesticide applicators to be at least 18 years old, upgrades pesticide training requirements, enacts whistleblower protections and allows improved access to important health records. On Sept. 22, Stewart Parnell, CEO of the Peanut Corporation of America, was sentenced to 28 years in jail for fraud and deliberately shipping tainted food. Nine people died and over 700 others became ill during a national outbreak of salmonella poisoning in 2008-2009 traced to the Georgia factory. Calling this sentencing “groundbreaking” and “a victory for consumers,” food safety lawyer Bill Marler said, “This sentence is going to send a stiff, cold wind through board rooms across the U.S.” (CNN.com, Sept. 22) If only it would put people before profits! In a more typical scenario, corporate giant General Motors got a slap on the wrist on Sept. 16: a $900 million fine and a three-year deferred prosecution agreement after its Cobalts and Saturn Ions led to 124 deaths and 275 injuries between 2003 and 2008. New York Times columnist Joe Nocera advocated on Sept. 26 for prosecution for corporate executives as “the most powerful deterrent imaginable.” Under capitalism at a dead end? Not likely. Only with a socialist revolution!